The Clan Mackenzie, The various Battalions of the 78th, Offers from F. H. Mackenzie, Esq. of Seaforth, to raise a Regiment for Government, Letter of service granted to F. H. Mackenzie, Esq., to raise a Regiment of Highlanders, to be numbered the 78th, The 1st Battalion, List of officers, Inspected and passed by Sir Hector Munro, Under Lord Moira in Guernsey, The Campaign of 1794—95 in Holland, The Regiment joins the Duke of York on the Weal, Nimeguen, Disastrous retreat on Deventer, The Regiment returns home, The Loyalist war in La Vendée, The Quiberon Expedition, Occupation of L’Ile Dieu, The Regiment returns home, Colonel F. H. Mackenzie’s proposals to raise a 2nd Battalion for the 78th, Letter of Service granted to him for that purpose, List of Officers, lnspected and passed by Sir Hector Munro, Granted the title of the Ross-shire Buffs, Ordered to England, Difficulties prior to embarkation at Portsmouth, The Regiment sails on secret service, Capture of the Cape of Good Hope, The Regiment goes into quarters at Capetown, until the arrival of the 1st Battalion. 1st and 2d Battalions amalgamated, The Regiment sails for the Cape, The consolidation completed, Capture of a Dutch fleet, Ordered to India, Lucknow, Cession of Allahabad, Various changes of Quarters, Colonels Alexander Mackenzie and J. R. Mackenzie quit the Regiment, Ordered to Bombay, Join General Wellesley’s Army, The Mahrattas, The Treaty of Bassein, Lake and Wellesley take the field, War between the British and the Mahrattas, Ahmednuggur taken, Battle of Assaye, Colours granted to the 74th and 78th, Wellesley’s pursuit of the Enemy, Battle of Argaum, Gawilghur taken, The Regiment goes to Goojerat, From Bombay to Goa, Excellent conduct, Ordered to Madras and thence to Java, Landing near Batavia, which is invested, The Cantonment of Waltevreeden forced, The Fortification of Cornelis captured, when General Jansens flies, Colonel Gillespie defeats Jansens, The French army surrender and evacuate the Island, Rebellion of the Sultan of Djokjokarta, His Capital is taken, and he is deposed, Colonel Fraser and Captain Macpherson murdered by Banditti at Probolingo, Major Forbes defeats the Insurgents, Thanks of Government to the Regiment, Expeditions against the Islands of Bali and Celebes, The Regiment sails for Calcutta, Six Companies wrecked on the Island of Preparis, General Orders by the Indian Government, The Regiment lands at Portsmouth and proceeds to Aberdeen, Unfounded charge against the Highland Regiments. Letter of Service granted to Major-General Mackenzie. Fraser to raise a 2nd Battalion, List of Officers, At Hythe under Sir John Moore, Ordered to Sicily, Sir John Stuart invades Calabria, Battle of Maida, The Regiment returns to Sicily, The Egyptian Expedition, Landing at Aboukir, Capture of Alexandria, Failure at Bosetta, Disastrous affair of El Hamet, Colonel M'Leod killed, Home, Sickness, Drafts to India, Waicheren Expedition, Death of General Mackenzie-Fraser, Operations against Napoleon in 1814, Holland, Brilliant affair of Merxem, Antwerp besieged, Various changes of Quarters, Napoleon returns from Elba, During the 100 Days, the Regiment garrisons Nieuwpoort, Sickness, Ordered to Brussels after Waterloo, Conduct of the Highlanders in the Netherlands, Home, Reduced, Effectives join the 1st Battalion, and the Dépôt proceeds to Aberdeen, Regiment is afterwards a single battalion, Ireland, Highland Society’s Presen, Reviewed by Sir David Baird, Sir Samuel Auchmuty’s Death, Sir Edward Barnes appointed Colonel, Service Companies embark at Cork for Ceylon, Kandy, Trincomalee, Galle, Cholera, Colombo, Home, Nuwera Ellis, Limerick, Cork, Glasgow, Liverpool, Burnley, Manchester, Dublin, Regimental Elephant, Canterbury, India, Poonah, Sindh, Kurrâchee, Sukkur, Fever, Bombay, Kirkee, Poonah, Lt. -Col. Douglas’s death, Belgaum, Aden, Arab outrages, Poonah, New Colours and Accoutrements, Highland Jacket. War declared with Persia, Expedition despatched, Gen. Stalker takes Resheer and Busheer, A second division despatched, of which the 78th forms part, and the whole placed under command of Sir James Outram, Expedition to Boorasjoon and destruction of the enemy’s stores, Night attack and battle of Kooshab, General Havelock joins the second division, Naval and military expedition up the Euphrates, Mohammrah bombarded and taken, Flight of the Shah-zada, Prince Khander Meerza, and his army, The Persian camps occupied, Expedition to Ahwaz, on the Karoon, The Shah-zada and his troops fly from 500 men to Shuster, Total destruction of the Persian depots of provisions at Ahwaz, Return of the expedition, Peace signed, Havelock’s opinion of the 78th, The 78th sail from Persia, and arrive safely at Calcutta. The Indian Mutiny, Barrackpoor, Benares, Allahabad, Havelock’s force, March to Cawnpoor and Lucknow, Futtehpoor, Aong, Pandoo Nuddee, Nana Sahib’s iniquities, The taking of Cawnpoor, Havelock’s opinion of the 78th, His stirring Order, March to Lucknow, Onao, Buseerutgunge, Havelock retires to Munghowar, Reinforced, Commences second march, Buseerutgunge again, Bourbeake Chowkey, Bithoor, Force returns to Cawnpoor, Cholera, Sir James Outram and reinforcements arrive, Sir James resigns command of the army of relief to Havelock, Third march to Lucknow, Munghowar, Lucknow reached, The enemy encountered and repulsed, The Alum Bagh occupied, Position of the garrison, Advance from the Alum Bagh, Char Bagh, The road to the Residency, The 78th the rear-guard, Its fierce encounter with the enemy, Fights its way to the main body at the Furrah Buksh, The desperate advance led by the 78th, The Residency reached, "Martin’s House", Dangerous position of Surgeons Jee and Home and their wounded men, The guns brought in, The Victoria Cross, Sorties upon the enemy, Arrangements for holding out until relief comes, Position of the 78th, Arrival of Sir Colin Campbell, Preparations for a junction, The relief effected, Evacuation of the Residency, The 78th selected to cover the retreat, Rewards, The occupation of the Alum Bagh under Colonel M’Intyre, Sir James Outram occupies the Alum Bagh, Engagement with the enemy, Sir James Outram’s opinion of the 78th, Capture of the city of Lucknow, The three field forces, The 78th occupy Bareilly, Ordered to England, Fėted at Bombay, Arrival at home. 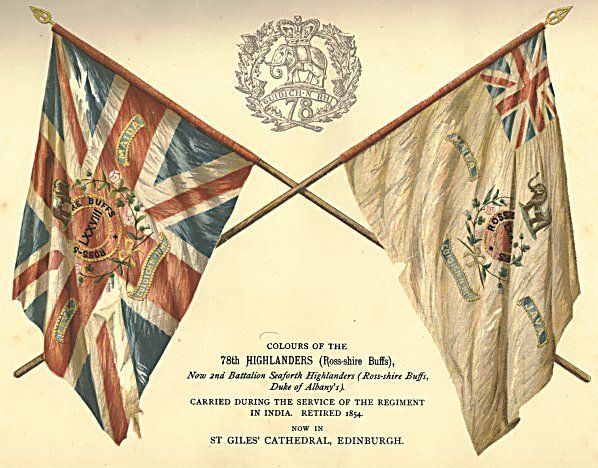 Reception of the regiment in the Northern Counties, Banquet at Brahan Castle, Regiment féted at Nairn and Inverness, Medals for Persia, Removed to Edinburgh, Officers and men féted at Edinburgh and Hamilton, Abolition of Grenadiers and Light Companies, Medals for the Indian Mutiny, Removed to Aldershot, thence to Shornclifle, thence to Dover, The Duke of Cambridge’s opinion of the 78th, Additional year’s service granted to Indian men, Inauguration of the Monument on the Castle Hill, Edinburgh, Presentation of Plate and Pipe-major’s Flag by the Countess of Ross and Cromarty, Lucknow Prize-money, Gibraltar, Retirement of Colonel MacIntyre, Retirement of Colonel Lockhart, His farewell Address, Canada, Presentation of Colours, Nova Scotia, Internal changes, Lieutenant-General Sir C. H. Doyle’s opinion of the 78th, Home, Belfast, Aids the civil power. Fort George, Aldershot, Review by the Emperor of Russia, Dover, Edinburgh, the Curragh, Retirement of Colonel Mackenzie, C. B., Reserves called out, Dublin, Orders to proceed to India, Poonah, Proceeds on Active Service to Afghanistan, Kurrachee, Sibi, Bolan Pass, Qnetta, Kandahar, Return to India, Sitapur and Benares, Linked with the 72nd Regiment, Lucknow, Presentation of Bronze Stars to Volunteers who had taken part in the march from Kabul to Kandahar, Two companies ordered to join the 1st Battalion Seaforth Highlanders for service in Egypt, Shalouf, Telel-Kebir, Zagazig, Return of Detachment to India, Banquet at Bombay, Addition of "Tel-el-Kebir" to distinctions, Monument at Lucknow, Bareilly, Hawal Pindi, Delhi, Bareilly.